Custom slat wall spacing unit on rotating casters. Or ... Soup to nuts and shipping too! The display was mounted on rotating casters and stood 66 inches tall by 60 inches wide by 36 inches deep. The display required custom slat wall spacing on all four sides with aluminum inserts for added strength. 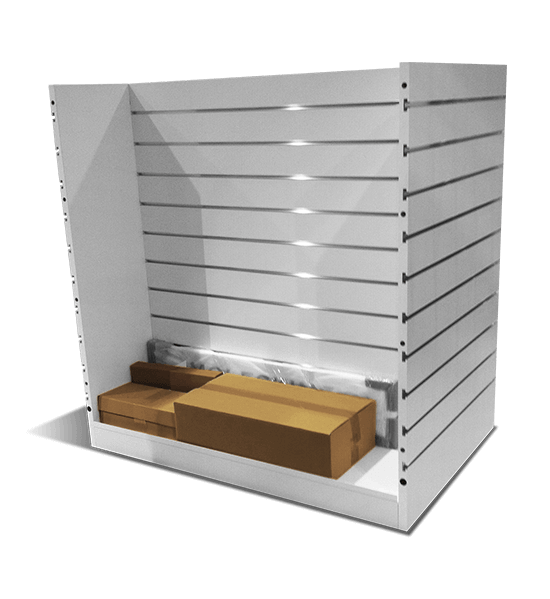 In addition to everything described above, we also had to design and build plastic slat wall displays, and design and outsource powder-coated steel slat wall shelves and steel display hooks. Finally, we designed and built a two-sided sign for the top of the display. Each display was individually packaged and shipped to customers’ specified locations across America. The only way forward here was to roll up our sleeves and get to work. We went back and forth with our concepts to the customer and pointed out ways to save time and money. It was a good collaboration and in the end the customer had a very successful new product launch.